One could be forgiven for assuming a film about political corruption made in the 1930’s could have nothing to say in these more sophisticated times, but that would be to downplay the significance of Frank Capra’s classic. From a time when ‘graft’ meant 200 acres of land, what could be relevant in the day of multi-billion dollar corporations and globalisation? When the incumbent Senator Foley dies, he is replaced by the naive leader of a boys movement, popular in his state for his idealistic vision of America and his fight for the future of his boys. Jefferson Smith is a true believer in ‘The American Way’, quotes Lincoln and Washington in his daily life, and idealises his father and his father’s best friend, Senator Paine, both of whom had fought for ‘lost causes’ all their lives. His appointment is at the behest of the business interests that control the Governor and the State, with the intention that his inexperience and youth will stop him from interfering in the passing of a bill that will bring these men a massive return on some shady land investments. The obvious conflict ensues, and it is in Washington that Senator Smith is truly tested. With the media aligned against him, powerful political enemies arrayed to hold him in line, and several beautiful women used to manipulate him, it seems there is no way for this idealist to survive. The strengths in this film lie in its amazing performances. 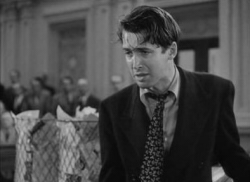 James Stewart is incredible – in his breakthrough role, he brings wide-eyed innocence mixed with a steely determination to stand up for his ideals. Ultimately, his actions are entirely predictable – for how else could this man react to the loss of his heroes? – and yet Stewart never fails to keep one captivated. The final act, containing the famous ‘filibuster scene’, is rightly acknowledged as one of cinema’s classic sequences, but it is only so due to the incredible screen presence of Stewart. With bicarbonate of soda on his vocal cords to increase the fatigue in his voice, a progressively more dishevelled appearance, and failing physical strength, his rally against corruption amongst his peers is inspiring cinema. Jean Arthur plays the embittered Clarissa Saunders, a woman who has spent so much time around these political machinations that she has seen it all. Initially kept on as Smith’s secretary by the corrupt businessman and his friends, she finds herself attracted to Smith’s idealism, and, underestimated by those who control her, becomes his most powerful ally. Arthur plays the world-weary cynic ‘Saunders’ of first impressions as if her life depended on it – she is abrupt, fiery, sarcastic and often plain rude. With a tear in her eye and a clearly adoring mien, her second half ‘Clarissa’ is a loving, supportive friend. Arthur handles this duality with great skill. Rounding out the main players is Claude Rains as Senator Paine. Best known for the later Casablanca, in which he shares one of the most famous scenes in movie history with Humphrey Bogart – Louis, I think this is the beginning of a beautiful friendship – this role requires a conflict of interest that he carries off superbly. An owned man, he must struggle with the idealism that resurfaces in his mind with the arrival of his former best friends son, and the compromises he has made over the years to enable his retention of power. His final decision is a powerful indication of where Capra stood on the issues raised in this film, and although it seems sudden, Rains’ quiet personal conflict had been quite effectively developed throughout. Unfortunately, there are some sections that aren’t quite pacy enough, and the overall running time of 129 minutes is a little excessive given the relatively straightforward nature of the story. Perhaps the earlier development sequences could have been more judiciously cut, which would allow the final act to have the resounding impact it could have had were the audience not fading. The final moments also aren’t well handled, with the abrupt change in fortune and final curtain seeming extremely precipitous given all that had come before. Earlier versions, however, included a much more detailed ending, but were cut after test audiences felt it reduced the impact. Perhaps some middle ground between these two approaches could have allowed a few moments for us to absorb the effect of the final actions without it seeming so sudden. Made in what we always assume were more innocent days, there is much of relevance to modern-day society. In a time when allegations against former President Clinton over the Whitewater scandal have never truly been resolved, and the possibility of similarly criminal actions by President George W. Bush in assisting business colleagues have also being raised, it seems this film is more accurate than ever. The message that men should act on principle to the betterment of their country seems a naive one, but find someone who doesn’t suspect that politicians worldwide are in their jobs for other than altruistic reasons. In this respect, Mr. Smith Goes To Washington has a similar call to the individual conscience that pervades the wonderful 12 Angry Men. 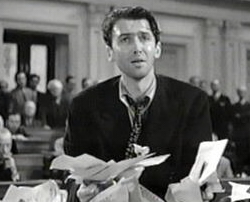 Nominated for eleven Academy Awards in 1940, but sadly the winner of only one (for Lewis R. Foster – Best Writing, Original Story), Mr. Smith Goes to Washington has rightly claimed a place amongst the most significant American films. Ranked 29th in the American Film Institute 100 greatest American films, and currently #76 in the all-time international top 250 at IMDb, it remains controversial with audiences, some of whom claim it is the ultimate in patriotism, while others denounce its perceived slight on the integrity of the democratic process. Highly recommended, and (yet) another example of what classic cinema can offer a modern viewer.